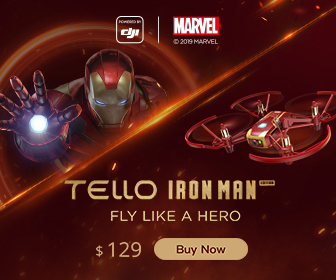 After the announcement of YI Erida back in September 2016 not much happened with Yi Technologie’s ambition to enter the drone market. 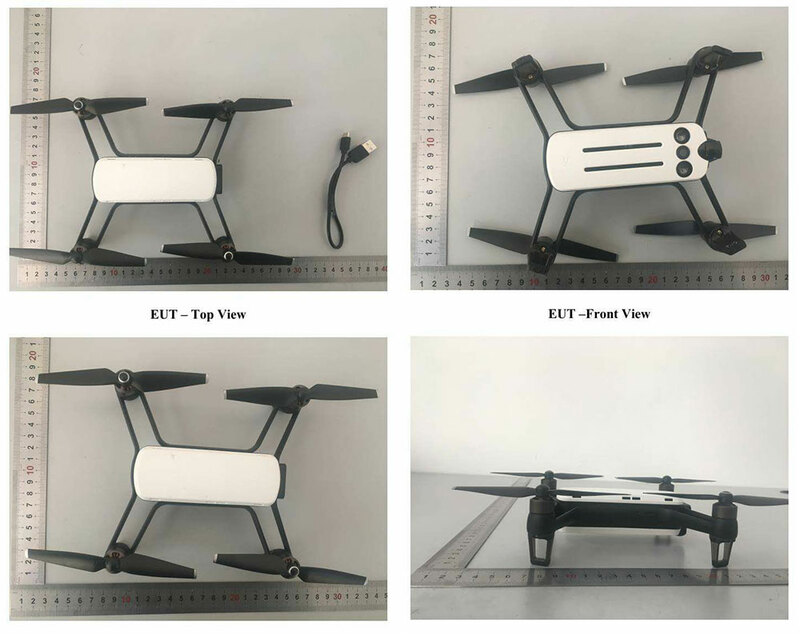 Now several sketches and images show a new YI Drone: YI Pixie. The new drone will feature 13MP photo and 4K video capabilities. 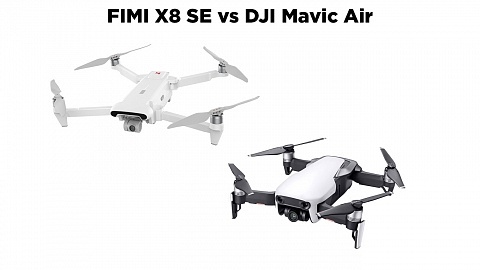 Since YI Erida was a joint venture with Atlas Dynamics there are some indications YI Pixie might be joint venture with Geniusidea as their drone and specs look almost the same. It seems the 13 MP Sony IMX214 sensor will be used. This is a very popular image sensor with smartphones, although there are few action cameras that use this sensor. The drone will feature a 117-degree FOV, 14mm lens. YI Pixie will feature EIS (electronic image stabilisation), you can adjust the angle of the camera, but the drone will not feature a gimbal. 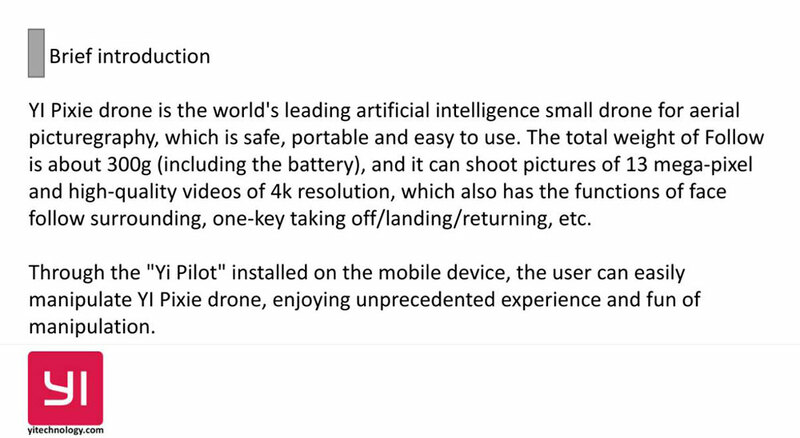 It seems that YI Pixie will only be controlled via mobile phone and no remote controller is available (compared to DJI Spark). Therefore control distance is limited to about 100m (wifi range). You can find screen shots later on in the App section. YI Pixie won’t have dedicated batteries, but instead use 2 standard 18650 rechargeable lithium-ion batteries. That’s very convenient as you don’t have to go for special batteries, you can find them almost everywhere and they are cheap (12 USD) with an option of several different charging stations. 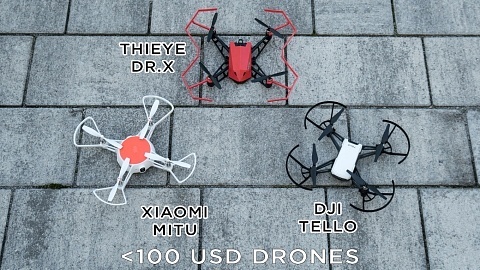 Each of them offers a capacity of 2500 mAh (5000 mAh in total) which should be good for about 20min of flight time. Yi Pixie will feature several sensors to support flight: Sonar, Optical Flow, Infrared avoidance sensor and GPS. 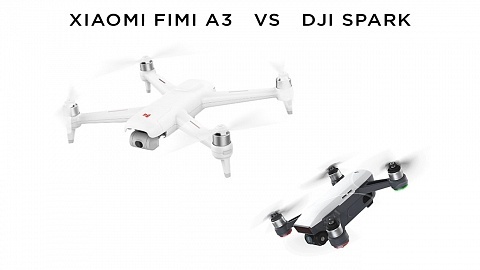 From the few photos it seems that YI Pixie has about the size and weight of DJI Spark, same with fixed arms. Besides some shooting modes like time-lapse, panorama or burst, there will be several flight shooting modes like panorama, where the drone performs a 360° turn for a photo. Cycling, where YI Pixie flies in circles around an object. And it will feature face tracking, where YI Pixie automatically follows your movements. ° Remote Control required – not included / Distance according to video transmission. °° Spark currently comes with free remote controller! * Flight times are as stated by the company. 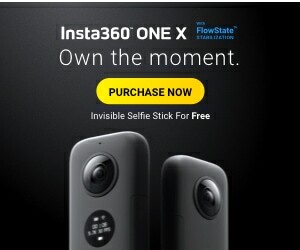 There are no infos about the price so far. Geniusidea drone is currently available for Pre-order for about 300 USD.